Bob would jump onto the footplate of one train, leap off again at some wayside spot, then clamber onto another train heading in the opposite direction. There was hardly a town in South Australia he did not visit, from Oodnadatta to Kalangadoo. In the early days of Australian railways, when shiny new tracks opened up vast areas of rural Australia, a special dog developed a taste for travel. Bob, as he was named by his first owner, Guard Ferry, travelled first with Guard Ferry then later on any train he could hitch a lift on, and became a favourite with drivers, guards and porters. Today, a photo of Bob still sits in memorial to him at Adelaide Station. Bob, the Railway Dog is a beautiful historical picture book told with the warm simplicity at which author Corinne Fenton is so very adept. WIih key facts and events wven into the story, readers will nontheless feel like it is a story, with Bob painted as a really endearing character. The artwork, in watercolour, charcoal and pencil, are similarly warm and inviting bringing both Bob and the era to life. Buildings, landscapes, people and, of course, Bob himself are rendered beautifully, making for a really attractive whole. Bob, the Railway Dog is a treasure. The illustrations are large photographs of various animals, chiefly of an adult with one or more young, showing affection (such as a giraffe kissing another), or in action. The text and illustrations are on white backgrounds, adding to the simplicity and making the overall product a gentle whole perfect for cuddle time or bedtime reading. Hey Mum, I Love You is a lovely complement to Hey Baby, but each stands alone. a puppy comes to live at Beth’s house. For Beth, it is too soon. Illustrations are soft watercolour a mixture of full colour openings and vignettes, reminiscent of Freya Blackwood’s work. Endpapers show Patches at puppy-play. ‘Chasing Shadows’ is a beautiful picture book combining poetic text with warm empathetic illustrations. The main character Beth is present in every illustration but it’s clear she is not present emotionally. She has withdrawn into herself in crippling sadness and depression. Not even the exuberant and comic actions of a new puppy can cut through. This is clearly more than normal sadness. Beth has disconnected from her world. Slowly, time and the puppy’s relentless joyfulness begin to distract although not free her. Only in crisis, does Beth find the courage to help Patches and in doing so, herself. Themes include loss, sadness, depression, love and happiness. ‘Chasing Shadows’ is a gentle book exploring big issues. Recommended for young readers, those experiencing loss and depression, and anyone who understands the power of dogs to help us heal ourselves. Occasionally a picture book comes along that is charming from start to finish. From the cute raccoons on the cover, through to the opening page with a wistful looking kitten and through the rest of the animals with their babies, this book is a delight. The photos are gorgeous and the faces of the various creatures so expressive. You will find everything from spider monkeys and chameleons to a new born duckling, a smiling dolphin, a grinning monkey and lastly two very special pictures. As the photographs pass though a wide array of animals, the lyrical text is simple yet conveys a lot of meaning, showing how special and unique each baby is. This is definitely a book to share with a precious new baby in the family. At $18.95 this would make an inexpressive yet treasured gift for any parents of a newborn. Given the theme and text with few words this makes it suitable especially for the 0+ age range. Highly recommended. Never doubt just how special you are. What a delightful first picture book this is. Speaking directly to a new born baby, this love letter reminds the child that there is nobody quite like him/her in simple text which will withstand multiple re readings and is short enough that even a wriggler will be able to last through its entirety. 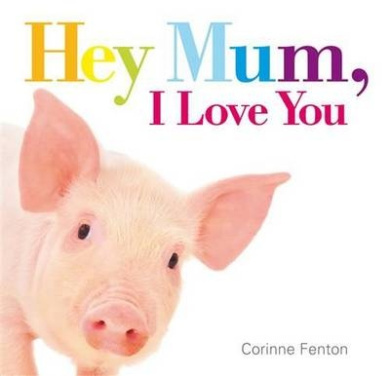 The text is supported by beautiful baby animal photographs which will captivate young viewers and also delight adult readers. There are kittens, elephants, zebras, monkeys, even fish and, in the final to photos, a baby. Whilst the title and the term ‘newborn’ baby in the text suggest the key target audience is newborns, older children will also enjoy the message of uniqueness and unconditional love, and the lively photo illustrations will also delight them. Hey Baby! would make a perfect gift for a baby shower or newborn. Whilst most Australian adults are familiar with the story of the dog on the tuckerbox, many Australian children are not. So it is wonderful to see the story brought to life in a beautiful picture book offering. The work of award-winning team Corrine Fenton and Peter Gouldthorpe, The Dog on the Tuckerboxis a visual and literary delight. Fenton tells the story of the loyal dog, Lady, and her master, Bill, using language both vivid and simple to record the tale and bring the time period to life. Gouldthorpe’s exquisite illustrations bring Lady, the bullocks and the rural landscape to life with a vividness that will have children wondering if they are indeed photographs. Part of Australia’s rich history of folklore, the story has been given a fresh lease of life for a new generation. The book has a timeless feel to it, which will make it a long-treasured addition to any home library. It will also be a valuable classroom resource and should find a home in every school library.